I am pleased to be among the speakers at the Roswell UFO Festival. The conference where I will be speaking is organized by Guy Malone and titled, 70 Years Later: Modern Challenges to the Extraterrestrial Hypothesis. I'll be doing a couple different presentations, one being The Greys Have Been Framed: Exploitation in Ufology and the Intersection of the Intelligence and UFO Communities. The other is MKULTRA to Gitmo: Correlations Between State Sponsored Involuntary Human Experimentation, Hypnosis and the UFO Community. There are certainly many different explanations for reported UFO phenomena and high strangeness, whatever those explanations may eventually prove to be, and I do not claim to know them all. I am not suggesting there is nothing necessarily of interest in all cases, anymore than I would suggest any given explanation or two would account for all reports. That stated, there are indeed many instances - readily available for citation - of exploitation of the topic of UFOs. I subsequently feel the methods employed by intelligence agencies and questionable researchers deserve attention in order to better understand how our opinions and beliefs developed. I will be exploring some of those instances, as well as situations and dynamics worthy of deeper consideration, in how they impact the UFO topic and alleged alien abduction genre. I advocate conducting such research in responsible manners: Accurately identify facts, then consider what the facts may indicate. I encourage differentiating between fact and opinion, as well as differentiating between scientific study and other forms of research and/or activities. Please allow me to emphasize I am not suggesting involuntary human experimentation necessarily accounts for any reports of alleged alien abduction. I do feel, however, some of the material deserves consideration in proper and responsible context. There are many possibilities of potential relevance. For instance, we now conclusively know that experiments were conducted in which chemicals were covertly dispersed in public places. We also know that unwitting research subjects were led into situations in which they were drugged and observed. There are numerous ways such circumstances could become intertwined with the UFO popular narratives, particularly considering that - during the mid 20th century time in question - most U.S. citizens did not even remotely suspect their federal government was capable of abusing them. Such research subjects might struggle to find explanations for their experiences, and confuse the circumstances with those that became commonly reported within the UFO community. The possibilities are many. Below are some key links to items addressed during my presentations, offered for those who would like sources and have a desire to read further. We will be discussing how such circumstances may, in some instances, affect public perception of UFOs. We will also explore correlations among some of the circumstances. Questions, comments, challenges to my points of view expressed during the presentations, and other inquiries may be emailed to me at the address located in my blogger profile. 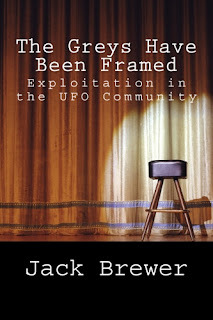 Some may choose to read my book, The Greys Have Been Framed: Exploitation in the UFO Community. It explores the ways the UFO topic has been manipulated by multiple demographics for a variety of reasons. Some of these reasons, it should be noted, have nothing to do with UFOs, but influence the genre as byproducts of the pursuit of unrelated objectives. Additionally explored rather thoroughly in the book are the cases of Simone Mendez, Leah Haley and Emma Woods, among others. - James Carrion maintains the blog, Anachronism, where you can download his book of the same name for free. Topics explored between his book and blog include the Ghost Rocket phenomenon, the possible significance of Project Seal during the summer of '47, and a group of potentially relevant intelligence officers known as Joint Security Control. - A 1949 Project Grudge report references the UFO topic as a potential psychological propaganda and warfare tool, including the planned release of unusual aerial objects. - In his book Silver Screen Saucers: Sorting Fact from Fantasy in Hollywood's UFO Movies, author Robbie Graham documents ongoing CIA interest in the portrayal of ET in film. This includes propaganda specialists employed as a production chief and a script writer on the set of the 1951 film, The Day the Earth Stood Still. 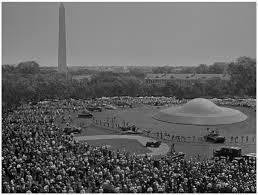 - The CIA's Role in the Study of UFOs, 1947-90, is available on the Agency website. It contains such info as CIA initially concealing sponsorship of the Robertson Panel, as well as concealing interest in use of the UFO controversy as a psychological warfare tool. - A now declassified 1954 CIA telegram suggested to operatives in Guatemala to consider fabricating a story about flying saucers as an option to distract public attention from Agency involvement in a coup. This was reported in a 2003 New York Times article, The C.I.A. 's Cover Has Been Blown? Just Make Up Something About U.F.O.'s. 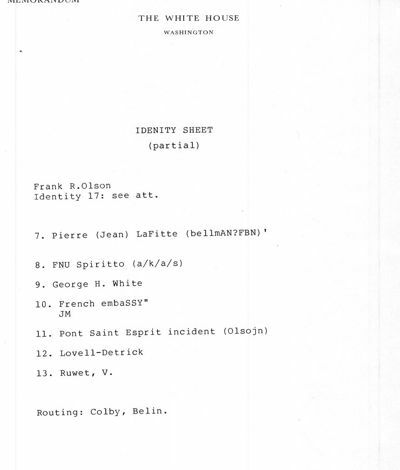 - CIA man Gene Poteat composed a report on the use of electronic countermeasures in his now declassified work, Stealth, Countermeasures, and ELINT, 1960-1975. Among items of potential interest to the UFO community include Poteat's description of the planned release of balloon-borne metalized spheres in coordination with the projection of false radar paints. - In his book The FBI-CIA-UFO Connection: The Hidden UFO Activities of USA Intelligence Agencies, author Bruce Maccabee, PhD, credited CIA man Ron Pandolfi with suggesting Agency interest in UFOs was for counterespionage purposes. Particularly, it was suggested, CIA obtained evidence in the 1970's that adversaries devised a plan to use U.S. citizens, including ufologists, to penetrate the U.S. defense program. - Investigation of Vincente DePaula is an article on a website maintained by Ron Regehr. It describes the reported interrogation by the Defense Investigative Service of the late Mr. DePaula, a former member of the UFO community who was employed in the defense industry to work on classified satellite systems. - Information about the 1980's Paul Bennewitz case - and the involvement of USAF Office of Special Investigations Special Agent Richard Doty - can be found in the work of Greg Bishop, Mark Pilkington and others. A 2014 Open Minds post by Alejandro Rojas documents his efforts to hold the evasive Air Force accountable for its role in the saga. The actions of Doty and the OSI might be considered in the context of the 1981 Simone Mendez case, to which I allocated a chapter in my book. - A 1999 FBI memo obtained by John Greenewald, Jr. of The Black Vault indicates the late Boyd B. Bushman was employed at Lockheed Martin and held Top Secret and SCI/SPA security clearances in his capacity as a Senior Specialist in the Special Programs Department. The memo further indicates Lockheed Martin harbored concerns of ongoing attempts to elicit classified information from Bushman. 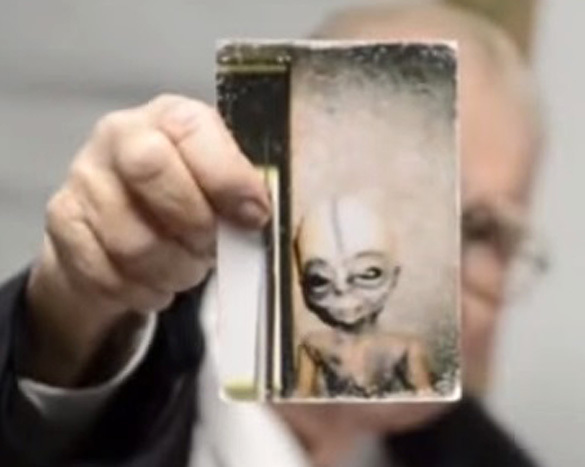 A 2014 video apparently shot by UFO enthusiasts showed Bushman explaining his interests in UFO and ET-related topics, which he described discussing throughout his career with a network of what he considered to be like-minded colleagues. The intriguing circumstances were explored in my blog post, Boyd Bushman, the FBI and Counterespionage. - The Carpenter Affair of the 1990's is covered in my book and rather extensively in a number of posts on my blog. It involved Missouri Social Worker, hypnotist, and MUFON Director of Abduction Research John Carpenter. He released data contained in the case files of 140 suspected alien abductees, including Leah Haley, without the knowledge or consent of the 140. They were hypnosis subjects of Carpenter, two of which he married. The data was provided to controversial philanthropist Robert Bigelow for review by him and his colleagues, which included Col. John Alexander, in exchange for a reported $14,000 paid to Carpenter. Stipulations of a 2001 five-year probation period eventually enforced upon the Social Worker license of Carpenter may be viewed via the State of Missouri public document, State Committee for Social Workers v. John S. Carpenter. - Millionaire searches for UFOs on ranch in Utah is a 1996 article published in the Eugene Register-Guard. It describes Robert Bigelow declining to be interviewed about Skinwalker Ranch, and Col. John Alexander, a Bigelow employee, explaining details will not be provided of how and why research is being conducted. - In 2011 James Carrion wrote he and an accompanying scientist were denied access to the Skinwalker Ranch, and Bigelow, during ill-fated dealings with MUFON, moved funds on behalf of what was described as an undisclosed financial sponsor. The identity of the sponsor was revealed only to John Schuessler, but not the rest of the MUFON board of directors. - In 2012 I published an interview of CB Scott Jones, a retired career intelligence officer who, among other noteworthy items, stated to Austin MUFON that he believed his friend Michael Drosnin was targeted by the FBI with an incapacitating mind control device. Jones claimed during the 2012 interview he continued to believe the UFO subject is used to cloak classified U.S. programs, including mind control operations. 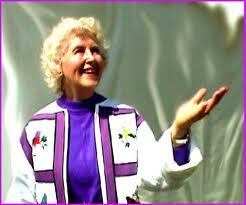 - That same year, 2012, I delved into the activities of Maj. Gen. Bert Stubblebine and his wife Dr. Rima Laibow. Stubblebine is credited with developing Remote Viewing, and Laibow formerly spoke at UFO conferences as an advocate for using hypnosis with alleged alien abductees. In more recent years the couple has supported increasingly questionable conspiracy theories, up to claiming attempts were made on the life of Laibow in retaliation for their activism. - Investigative journalist Sharon Weinberger published the article Mind Games in 2007 in Washington Post Magazine. It included an interview with Col. John Alexander, who suggested mind control projects were receiving renewed interest post-9/11, and that electronic neutering might prove beneficial on detainees such as held at Guantanamo Bay. "Maybe I can fix you, or electronically neuter you," Alexander was quoted by Weinberger, "so it's safe to release you into society, so you won't come back and kill me." - The American Psychology Association (APA) explains its stances on hypnosis as a therapeutic tool, not a memory retrieval technique. Further reading includes the work of experimental psychologist and renowned memory expert Dr. Elizabeth Loftus. Also relevant is the work of experimental psychologist Dr. Julia Shaw, among many others, who clarify it's not a matter of if memory is flawed, but how flawed, and that memory enhancing techniques are conclusively unreliable. - I exchanged emails in 2013 with hypnotist Barbara Lamb about her claim "ET-human hybrids are real and they are here." According to a MUFON promotional email containing the statement, Lamb hypnotically regressed hundreds of people, some of which, with her "help," discovered they were hybrids. During the email exchange, I urged Lamb to directly address if any objective third parties had conducted any kinds of analysis which would lend support to her repeated claims she knows people with ET DNA. She then stopped corresponding. - In 2012 I interviewed David Jacobs, PhD (in history), a self-described investigator of alien abduction. His bizarre and often convoluted claims about alleged aliens and ET-human hybrids are described at length in my book. Further info can be found at the website of Emma Woods, including recordings of long distance international telephone hypnosis sessions Jacobs conducted with the woman. It is important to listen to the recordings if you desire to develop an informed opinion about investigative techniques used by Jacobs, the Woods case, and his claims of being an advocate of strict scientific and ethical research methodologies. The methods used do not support either his claims or fantastic conclusions. - The Search for the Manchurian Candidate by John Marks, circa 1979, remains a valuable resource on Project MKULTRA, mid 20th century behavior modification operations, what's known of the personnel involved, and what's known of the experiments using hypnosis, drugs and torture for a variety of stated purposes. Marks' book includes further reading on the activities of George H. Estabrooks, Milton Kline, Martin Orne and George Hunter White. - A 1954 MKULTRA document titled Hypnotic Experimentation and Research described how a woman was successfully directed during hypnosis to fire a pistol at another female hypnosis subject, unaware the gun was not loaded. Researchers claimed the subjects reported no memories of the events taking place. - A now declassified document titled SI and H Experimentation (25 September 1951) contains the claims of CIA researchers that they successfully administered post-hypnotic suggestions via telephone. The suggestions involved the experimental subject delivering a post-hypnotic code to a second subject, who executed detailed instructions while hiding what appeared to be a bomb in a public location. Researchers further claimed the subjects largely could not recall their participation in the experiment. 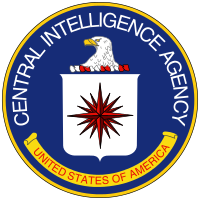 - The CIA online library contains the article, Hypnosis in Interrogation, approved for release in 1993. The Edward F. Deshere piece describes recommendations from hypnosis expert and MKULTRA consultant Martin Orne, which included the use of a "magic room," props, and pseudo-hypnosis shams in order to deceive detainees into thinking they were defenseless against advanced hypnosis techniques. - The 2015 Hoffman Report documented APA involvement in 21st century national security interrogations and collusion in conducting torture. The document references the possibility hypnosis was used during the interrogation of Petty Officer Daniel King as conducted by psychologist Michael Gelles. The report describes findings of an APA ethics committee liaison who described the actions of Gelles as "misleading," and added that Gelles could have offered King substantial help understanding how false memories can be established and solidified during interrogation. Further documented in the Hoffman Report was the presence of at least one other hypnosis expert as a relatively present day long time CIA consultant. - The 2012 New Yorker article Operation Delirium offers insight into the madness of MKULTRA while depicting circumstances surrounding experiments conducted at Edgewood Arsenal during the mid 20th century. - Intellipedia, an intelligence community resource, contained a now declassified entry on MKULTRA describing project objectives, abused citizens of note (which include Theodore Kaczynski, who became the infamous Unabomber), and numerous well-sourced items of interest. - Writer/researcher Hank Albarelli, Jr. summarizes in a 2010 blog post why he suspects the Pont-Saint-Esprit tragedy was a CIA weapons research and development project involving MKNAOMI personnel. - My 2014 blog post Psy Ops and Mind Control: Then, Now and the UFO Community includes links to work by Albarelli, psychologist Dr. Jeffrey Kaye, journalist Jason Leopold and others. Aspects of Project Artichoke and their possible significance are considered. - Army Cold War Chemical Research Report is a 2017 blog post I did on a declassified 1976 Army Inspector General report addressing 25 years of chemical research, development, and testing on humans. The report correlates the existence of Special Purpose Teams deployed for use on "nonvolunteers" as described in the work of Albarelli and his references to Artichoke, as linked above. - Dr. Jeffrey Kaye and Jason Leopold reported extensively on how 21st century CIA "enhanced interrogation techniques" as used at Guantanamo Bay constituted involuntary human experimentation. Such collaborations by Kaye and Leopold include a 2012 article based upon an inspector general report that explained CIA was administering powerful antipsychotic and other medications as treatment for conditions caused by the very interrogation techniques employed and continued. A 2010 article documented that Gitmo detainees were given five times the normal dosage of Methloquine, substantially increasing the likelihood of effects such as hallucinations and paranoid delusions. The drug belongs to a class known as quinolines, was explored as part of the MKULTRA program, and is sometimes used in much smaller doses to treat malaria, which the detainees did not have. Kaye is author of the book, Cover-up at Guantanamo: The NCIS Investigation into the "Suicides" of Mohammed Al Hanashi and Abdul Rahman Al Amri. - Writer/researcher Joseph Hickman served in the 629th Military Intelligence Battalion at Guantanamo Bay. He described in an interview with Reader Supported News the failed process that created the Gitmo prisoner population, how human experimentation occurred, and how ideas implemented evolved out of MKULTRA. 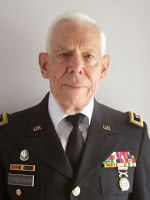 Hickman is writing extensively about his experience in the military, including his book, Murder at Camp Delta: A Staff Sergeant's Pursuit of the Truth About Guantanamo Bay. - Research materials recommended for review include the Seton Hall Law Center paper, Guantanamo: America's Battle Lab, the now declassified Fay Report, the previously referenced Hoffman Report, and reports published by Physicians for Human Rights (PHR). Just days ago, PHR published Nuremburg Betrayed: Human Experimentation and the CIA Torture Program, concluding the CIA post-9/11 torture operations constituted unethical and experimental research on unwilling human subjects. PHR reported that torture techniques were designed and implemented by health professionals, who then collected data on torture's effects. The circumstances are described as "one of the gravest breaches of medical ethics by U.S. health personnel since the Nuremburg Code was developed." - In 2008 a Kansas court issued the first-of-its-kind order of protection banning a man from electronically harassing a former business associate. James Walbert told the court he was threatened with "jolts of radiation," then later claimed to feel sensations of electric shocks, hear electronically generated tones, and hear ringing in his ears. Walbert's former associate was subsequently banned from using electronic means to harass him. - In his 1985 book, The Body Electric, author Dr. Robert Becker explained how researchers at Walter Reed Army Institute of Research claimed to have successfully transmitted spoken words directly to the human brain via pulsed microwaves in 1973. - In 2008 Sharon Weinberger reported the Army removed a page from its website depicting "voice to skull" devices. The non-lethal weapon was described as a neuroelectromagnetic device capable of sending sound into the skull of persons or animals. - In 2013 an Emergency Defense Motion was filed at Guantanamo Bay on behalf of Bin al Shibh. The motion sought relief from sounds and vibrations directed at the detainee. - Psychiatrist Dr. Emily A. Keram evaluated Gitmo detainee Shaker Aamer in 2013. Keram quoted Aamer as claiming to believe some kind of electromagnetic or radiation weapons were directed at him. He described the effects as feeling in a trance and difficulty getting his body to move. - Former presidential candidate and UFO witness Dennis Kucinich proposed for legislation the Space Preservation Act of 2001. The bill, which did not pass, sought to ban space-based and airborne weapons which used electromagnetic, radiation, or other energies directed at individual persons or targeted populations for the purpose of information war, mood management or mind control.